With great sadness we announce the passing of our beloved wife, mother, grandma, sister, aunt and friend. Judy Dianne Dougherty passed away peacefully on Wednesday, August 29th, 2018. Judy will be greatly missed by her loving husband of 29 years, Doug Sullivan; her son, Kurtis Dunlop; grandson, Xander; stepson, Mike (Tracy and grandchildren: Jaden, Cameron and William; stepson, Tim (Kirby) and grandchildren: Zoey, Emmet and Jordyn. She was predeceased by her father, Gordon in 2018; and is survived by her mother, Marguerite; siblings: Michael (Nancy), Gary (Brenda), and Marilyn (Kevin); Doug’s siblings: Tom (Sharon), Don (Jean), Joan (Butch), Bill (Linda), and Alan (Jean); special aunt and uncle, Jean and Don; as well as numerous nieces and nephews, aunts and uncles, great-nieces and nephews, and many good friends. Judy would be the first person to tell you she was a fortunate person. She had a wonderful life and lived every moment to the fullest. Judy enjoyed her family and friends, travelling with them, golfing, socializing, country, dancing and more socializing, AND believe it or not working! Judy was the “heart” of Heartland Livestock, she was a loyal employee for 40 + years. Her customers always came first! Family was very important to Judy. She was continually hosting family and friends throughout the year and especially enjoyed entertaining at Thomson Lake. She grew up playing many different sports and most recently she spent many hours watching her grandson, Xander play ball and hockey. An early introduction to travel by her parents created a lifelong travel bug that Judy continued until her passing. Travels to Disney were a priority, she was excited to have taken her grandchildren to Disney World and wished she could have had more opportunity for other trips. Judy loved country music. One of her favorite trips was with Doug to Nashville. The highlight was a day trip to see the King of Rock & Roll at Graceland! Judy loved Elvis as much as she loved bling. Many years ago Judy found a treasure in a little valley called Craven. Judy and Doug have many fond memories of camping and socializing at the Jamboree. Judy attended the very first event and they hardly missed a year. The family would like to extend a special thanks to Judy’s doctor and friend, Dr Jan Vermaak and the nurses on 3B Oncology at the Pasqua Hospital for their exceptional care. 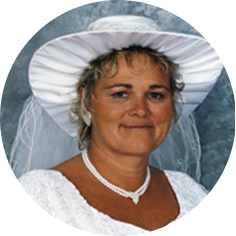 A Memorial Service for Judy will be held on Friday, September 7th, 2018 at 1:30 p.m. at Hillcrest Apostolic Church, 1550 Main St N, Moose Jaw, SK. Flowers are gratefully declined. As an expression of sympathy, donations in Judy’s name may be made to the Allan Blair Cancer Centre c/o Pasqua Hospital, 4101 Dewdney Ave, Regina, SK S4T 7T1.